One in five Canadians will experience a mental illness in their lifetime. In any year, 12 percent of Canadians age 15 to 64 suffer from a mental disorder or substance dependence, at least 4 percent suffer from major depression and three times that many have minor depression. Mental illness accounts for more than 15 percent of the burden of disease in Canada, but gets only about 5.5 percent of public health dollars. And stigma, although on the decline, is still a big issue. In the workplace, mental illness is the second leading cause of disability, each day 500,000 Canadians are absent from work for mental health issues and accounts for nearly 30 percent of disability claims and 70 percent of total costs and claims attributable to mental illness have overtaken claims associated with cardiovascular disease as the fastest growing category of disability costs in Canada. Relatively few Canadians who need mental health services get help. One study indicated that only 32 percent of those with a mental disorders or substance dependency saw or talked to a health professional during the 12 months prior to the survey. The professional most often contacted is a family physician, followed by psychiatrists and psychologists. In Canada, there are about 12 psychiatrists for every 100,000 people, compared with 35 psychologists. Other professionals providing mental health services include psychiatric nurses and social workers. A lot of mental health services are provided in the private health sector. If a person sees a psychologist outside of a hospital, they have to pay, either out-of-pocket and/or through private (often employer sponsored) insurance. One study showed that in 2003, for people over age 20, almost 500,000 persons consulted a psychologist; over 70 percent had at least some portion of the cost paid by private insurance; the rest paid entirely out-of-pocket. But there is good news. The chart below shows the results of patient perceived outcomes for users of mental health services, Ontario, 2004. In general, the response from business and industry to workplace mental health problems has not been adequate. Much has fallen to Employee Assistance Programs (EAP). While an EAP may be appropriate for certain items, when it comes to mental health care for employees, EAP's do not go far enough. EAP's may best work as a short-term way for employees to enter the mental health service arena, but they are not set up to effectively deal with many issues. Depression is one of the most prevalent mental health conditions, in and out of the workplace, and while medication is often a big help, psychotherapy is also very beneficial, often in combination with medication. One of the most widely accepted interventions showing excellent results is Cognitive Behaviour Therapy (CBT), often done over a course of 12 to 16 sessions. However, most EAPs allow for only a few visits in any one year (often four to six) or a few visits for any one condition. Another shortcoming of EAP's is they often only use clinicians who are not trained or able to offer treatments such as CBT. But EAP's can refer depressed employees to other facilities and/or service providers; the issue then comes back to availability of professionals and cost. Still, EAP's should be aware of local resources and at least be able to screen those who present with depression and/or other mental health problems. Health benefits offered by the workplace are also largely inadequate for dealing with mental health. Many plans do not cover psychological services sufficiently to allow for a proper course of therapy. Another issue with health benefits plans is that coverage for "other professionals", usually referred to in those plans as "para-medical" providers, may lump these disciplines with a cap on services each year. Services from a psychologist may be covered under the same umbrella as services from optometrists, physiotherapists, chiropractors, etc., with a limit of perhaps $500 per year. 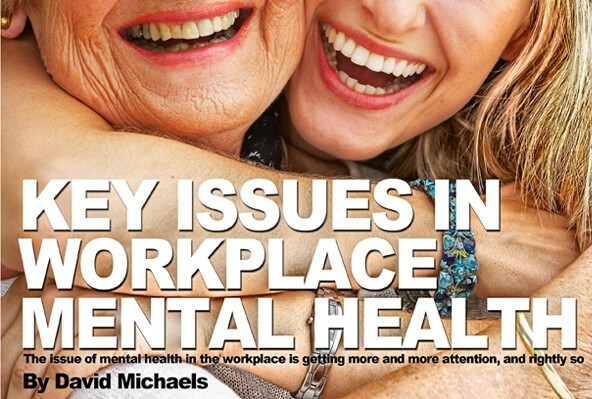 The current situation with workplace mental health mirrors mental health in Canada generally. Those with mental health issues face difficulty accessing services as not a lot is covered by the public health system. Also, there is the issue of stigma; many people fear what others will think. A lot of people are not aware of the fact that current approaches to dealing with mental health conditions show excellent results. In the workplace, two of the most common ways of addressing the issue, EAP's and health benefits programs, have significant limitations. And of course, offering more under benefits plans, even though there may be a longer-term payback, has short-term cost implications which businesses are not likely to assume, especially in the current economic climate. Employers can take some proactive approaches to deal with mental health in the workplace, including education. Workplaces can link with resources in the community, whether directly or through their EAP. Being aware of issues, ensuring a workplace that doesn't stigmatize, educating, and promoting optimal mental health, are good places to start. David Michaels is the CEO at The Clinic For Emotional Wellness Inc in Vaughan, Ontario. David holds a Master's degree in health administration from the University of Toronto and experience in government, public and private health care, including over 16 years as the Administrator of one of Canada's largest children's mental health centres.